Data shown is for U.S. Wii owners only, not world-wide. 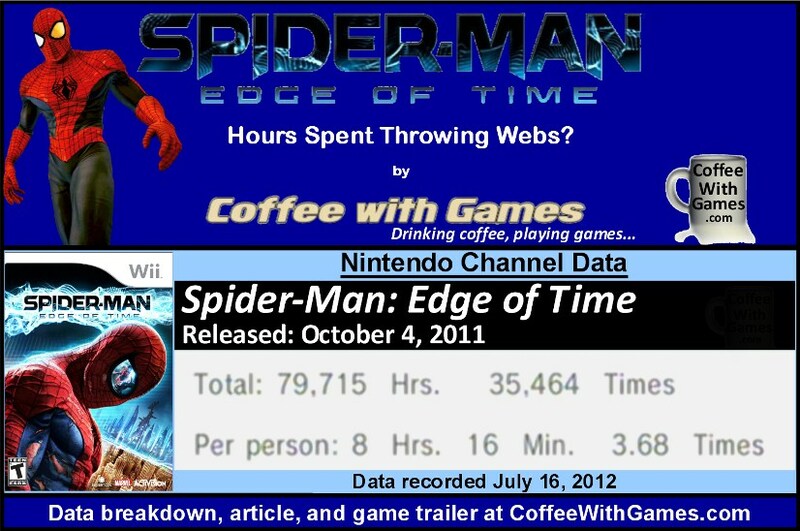 Spider-Man: Edge of Time has 9,636 U.S. Wii owners that have reported game-play hours through the Nintendo Channel, with 286 days possibly reported. 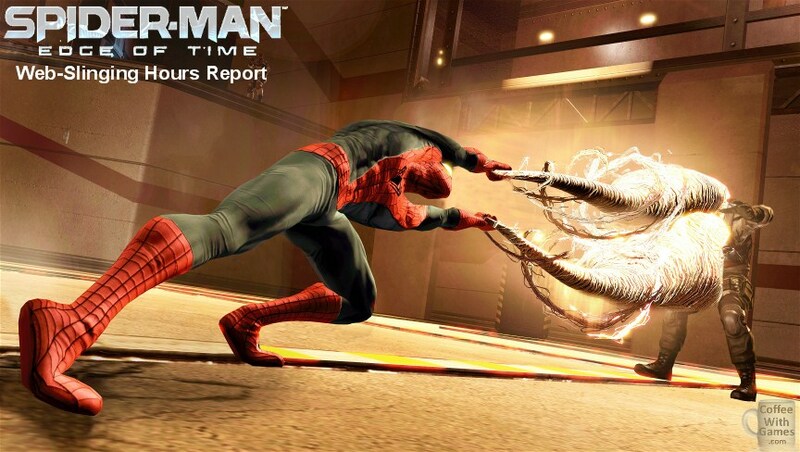 The game has an average play-time per day/session of 2 Hours 14 Minutes, which I think is interesting because it is just about the length of each Spider-Man movie that has released since the original Spider-Man in 2002. What did the critics and customers think about Spider-Man: Edge of Time, and do the review scores show a big difference between the customers' and critics' enjoyment from the game? The game has a "professional" critic review score average of 61.14% based on 7 reviews on GameRankings.com, while the customer review score average for Edge of Time is 85.00% based on 8 reviews on Amazon.com. I would say an almost 25% higher customer review score average over the critic, is a pretty significant difference. I enjoyed the Spider-Man universe when I was younger, and when writing this post I remembered that I had played a handheld Spider-Man game when I was much younger. After doing some searches, I found the portable Spider-Man game I poured many hours into as a child. The second Spider-Man game I can remember playing is Spider-Man: The Movie, which I purchased from Babbage's the day it released at our local mall for my GameCube. It only took me a few days of playing the game before I finished it though, so I returned it to Babbage's for a full store credit, or refund. Why did the trailer catch my attention? First, it starts off early by asking an important question that has been debated for at least a few thousand years now, "What happens after we die?" Something to think about for sure. It also seems to show that Edge of Time has a different setting from the typical web-slinging Spider-Man games, perhaps with more inside battles and not as much open web-slinging through the city? At least that was my impression from watching the trailer. As for the reported data, I think the average of just over 8 hours per Wii owner perhaps shows this is a shorter Spider-Man game, perhaps like the original Spider-Man: The Movie? I'm not sure if I would put this on my "Wish List" based on the reported average hours and being that I don't follow the Spider-Man universe a whole lot anymore, but seeing the customer review score average for it would probably make me take a second look at it if I spotted it for around $10 now. Have any of you played Spider-Man: Edge of Time on the Wii, or perhaps another console? If you have played the Wii version, are the motion controls implemented well in the game? Being that I haven't played any of the Spider-Man Wii games, but I do enjoy motion controls, is there one Spider-Man Wii game you would recommend above others if you have played several of the games? Check out Shattered Dimensions. Great game. As for Edge of Time, you know how I feel about it from my playthrough of the 3DS version. Haha! I try to make sure to do a wide variety of data posts, and not necessarily just the more popular games. I do many on games (this one as well) that I haven't played, and if I watch/see a game debut I try to get the report as soon as it happens. Speaking of ET, I saw an Atari Retro system at Wal-Mart today for $30. Included a system and "60" games...not sure if ET was on it. Kind of interested now. LOL. It was a "plug-and-play" type system, so no cartridges or anything. I saw that only last week for $69 AUD at Gametraders. That's expensive! Shattered Dimensions stood out in some of the customer reviews on the other Spider-Man games, which is interesting as it and this one aren't directly movie related. The price at the store for the Atari system was originally listed as $39.99 USD, but had a price drop down to $29.99 USD.